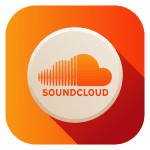 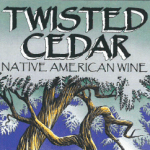 December 11, 2015 – The accolades are flooding in! 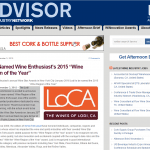 The Lodi Winegrape Commission is excited to announce that Lodi has been named “Wine Region of the Year” by the Wine Enthusiast, one of the world’s most well regarded publications dedicated to wine, spirits, food and travel. 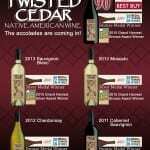 Theannouncement was made this morning, with the actual award to be presented at the Wine Star Awards on January 25th – the publication’s annual black-tie gala dinner at the New York Public Library in New York City. 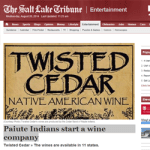 “Utah is now one of 11 states to carry a new brand of liquor made by the Cedar Band, one of the five bands of the Paiute Indian Tribe of Utah. 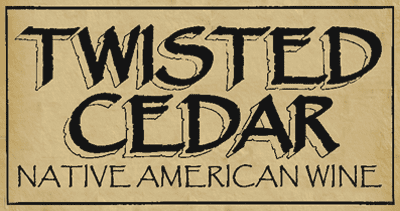 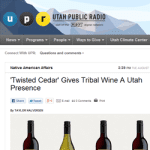 “The Cedar Band of Paiute Indians has ventured into the wine business, producing and bottling several varietals under the Twisted Cedar label.